Le site web est amené à évoluer, par souci d'ergonomie et de par son contenu qui s'enrichi. Indeed, part respectful adherents to a certain ethic and its water plan dedicated solely to this fishery, Ardennes anglers, but also neighbouring or more distant, departments may practice in a natural and preserved environment, their fishing art. Associative water management to provide quality fishing in a protected environment at a rate considerably lower than other tanks. Maintenance of the site and the home of fishermen, fish, home, security management, are indeed carried out voluntarily by members of the association. Simplicity, ease of use are the key words which tranparaissent in contact with the members. No one shall be covetous of tips or tricks to facilitate Lady trout or increase his knowledge about this activity, o how many rewarding and exotic, in this society where everything is speed, profits and stress! Join us, to also enjoy the well-being that prodigal fishing fly and soon at the water's edge! Located in the heart of the Ardennes Department, 20 minutes from Charleville-Mézières or Sedan, 50 mn from Reims, 2 h 15 from Paris by A4 - A34, is Saint Roger's Source tank. This body of water of a hectare and a half, integrated in a natural and protected, is fed continuously by the source St Roger upstream and pop-up surrounding woods. It also provided drinking water the city of Charleville-Mézières. The water quality is therefore naturally exceptional. His profile is varied with some high Fund and ditches up to 2.80 m approximately, crossed by the original bed of the stream, the Dungeon; on a limestone bottom, diverse aquatic vegetation, rich in microorganisms, allows the fish find the food needed for their food. There are: mayflies (baetis, fly may danica and vulgata), caddisflies, sialis, gammarids, midges, dragonflies; but also frogs (tadpoles), newts, snails, and crayfish, all indicators of the healthier water. For fish, you are catching trout Rainbow sky, stocks or fountain of quality salmon, and if you're lucky or opinionated Aboriginal stocks! 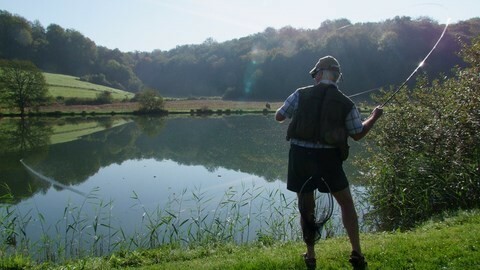 You can practice in dry, sinking, streamer and especially nymph in view, which is the particular appeal of the fact of clear water at all times whatever the season. Fishing with Barbless (or crushed) is required, limited in size no. 10 to 20, no.-kill of rigour. The Reservoir of Saint Roger's Source is open and passable year-round part its classification. However, it is necessary to have a licence with the appropriate stamps or reciprocitaires. The House of fishermen take the meal away, a barbecue is available and allows grills on-site. The environment of the water is nice and green. Unspoilt nature and forest walks or horseback riding lovers will be delighted. Bikers will organize in their favorite sport, thanks to the trails woods nearby; without forgetting the laziest which may of course take a NAP in the shade of an oak tree!